Bill Gates gave the PHE community a much-needed upgrade in his foundation’s 2nd Annual Letter, released this week. Unfortunately it still has a few bugs. “In the long run, not spending on health is a bad deal for the environment because improvements in health, including voluntary family planning, lead people to have smaller families, which in turn reduces the strain on the environment,” concludes Gates. This statement could dramatically raise awareness of and funding for population-environment programs. Any time Bill Gates talks, the world listens, as evidenced by the barrage of coverage from Reuters, AFP, and top IT newswires. 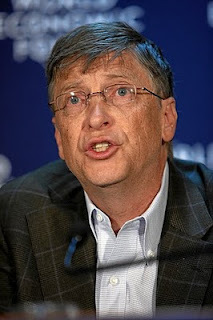 For the public, it offers a rare glimpse into development strategy, so Gates’ thoughts (and financial commitments) could be seen as representative of the foundation community’s approach to global health problems. Although it may seem obvious that fewer people place less strain on the environment, this connection has been largely absent from the environmental agenda, including the efforts to combat climate change. Some environmental leaders and organizations have dismissed population as an unimportant distraction from the real business at hand. Others have noted that population growth’s impact on climate change is far greater in the rich world than in poor countries, whose per capita emissions are a fraction of developed countries’. Gates’ comment may cause those in the first camp to re-evaluate the importance of family planning, and it is likely to energize the converted. But it will have less impact on those focused on consumption. But if it encourages the environmental community to put population and family planning issues back on the table, it will have gone a long way. However, Gates could have gone further, by explaining that family planning is a relatively inexpensive way to mitigate climate change, compared to complex and emerging technological solutions. He also could have pointed out that climate change is expected to increase the prevalence of vector-borne diseases such as malaria, or that sick or malnourished individuals may be forced to mismanage natural resources. Because Gates didn’t make these explicit connections, many in the media missed his point. The wire headlines pit health against environment, when Gates was in fact pointing out how interdependent they are. This distortion is symptomatic of the media’s tendency to highlight the horserace. But maybe they would pay closer attention if the Gates Foundation put its money where its mouth is—and funded programs that integrate family planning and the environment. Perhaps several years from now, we will look back and say that this letter marks the start of the Gates Foundation’s integrated approach to development. But we may need to wait for Letter 3.0 for a complete install. global health is a long term goal to achieve it.